Wednesday morning found El Rancho entertaining Horadada in the VCL and found themselves with an uphill battle, not quite getting to the top, but they did however take the 2 rinks matches and drew the pairs. Ladies singles: Sheila Cooper 9-21. Gents singles: Brian Harris 4-21. Pairs: Jan Bright and Shirley Edwards 13-13. Trips: Bob Easthope, Ron Edwards and Richard Needham 8-26. Rinks: Diane Yates, Emma Walsh, Barry Bright and David Whitworth 17-8. Rinks: Brian Taylor, Pam Harris, Ann Taylor and Jim Taylor 20-16. On Friday the Buckskins played host to San Luis Hercules, with a gusting breeze causing a little consternation, but we add fun and the company was great. The Buckskins took 4 rinks against Hercules 2 and also the overall shots. Richard Needham, Bob Easthope and Jim Gracie 11-16. Graham Day, Brian Harris and John Skipper 18-9. 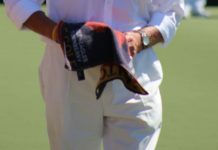 In the LLB Men’s 4 wood pairs versus Quesada, home result – 21 shots for. 19 shots against. Away result – 11 shots for . 22 shots against. 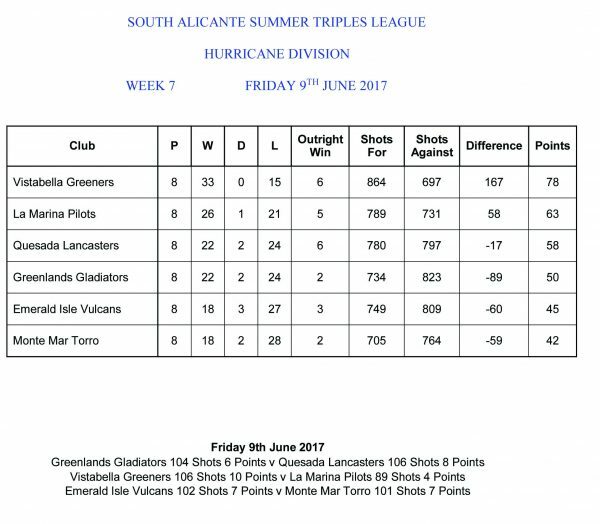 In the South Alicante Hurricane Division, The Gladiators were at home to Quesada Lancasters. Final score – – Total shots for – 104. against 106. Points for – 6. Points against – 8. Winning rinks were – Sheila Stead, Dave Giddings, skip Jim Oliver. 22 shots to 13. Janet Bliss, Margaret Dewar, skip Dave Dudding. 19 shots to 15. Vic Young, Mary Lockley, skip Mel Brown. 30 shots to 21. 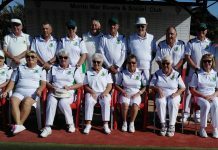 Greenlands B. C. have vacancies for new members for the forthcoming new summer and Winter Leagues. For all enquiries please telephone Haley on 966 84 4399. 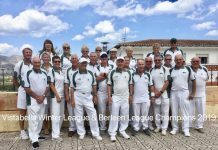 To be honest I didn’t know the 4 wood Pairs League was going on but I am glad to say I believe we could be top at the moment after beating Vistabella 4 – 1. Tom Spencer and Peter Parsons had a good draw whereas the two Dave’s, Taylor and Hadaway won 19-14. Keep it going. On to the VCL and there we languish at the bottom but watch out. We went over to Quesada the Numero Uno and won 8-6. We could have had another two points as Quesada only had the overall score by two shots. Shot of the match has to be Captain Colin on the last end when his team of Lynne Armitage and Martin Butler had dropped a four on end 17 only to pick up a five with Colin’s last wood to win 25-24. Well done to the Parsons both playing the Singles,(not together), it seemed to carry on as in real live and be together as they both won 21-16. Last but not least came Barbara Forshaw, Mike Smith, Wendy Latham and Barry Latham who played an ex La Marina player and great friend, Fred Roberts. In an intense game right until the last end we managed to win by just two shots. The Pilots got well and truly blown away, away at the Vistabella Greeners green by 10 points to 4. Our only two winners were Dave O’Sullivan, Arthur Cronk and Dave Hadaway 23-12 and Jean Tregoing, Peter Bailey and Mike Smith 14-11. No doubt they will be fighting back next week. 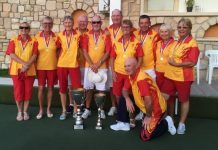 Following the finish of the Spanish National Championships the league matches resumed with La Siesta playing two matches in the VCL League against Greenlands Jasmines and Emerald Isle. Wins for Pat Reilly and Irene Mangan in the singles produced wins backed up by a 28-12 victory for Jack Burrell, Trish Reilly, Pat Harman and Mike Edwards in the Rinks. However, losses in the Pairs, Triples and other rinks match saw an overall loss by 120 shots to 102 to the Jasmines with La Siesta picking up 6 points to their opponents 8. Unfortunately the result against Emerald Isle was not as good with a 127 shots to 71 loss with our opponents picking up a maximum 14 points. A great result for the Wasps in the South Alicante Spitfire Division with a 107shots to 86 win away at San Luis getting 11 points to their opponents 3. Star place goes to Irene & Dave Laverick with Brian Harman who from the 6th end never looked back from, where they picked up six shots. Dave Davies with Florence & Mike lead from the start to win convincingly whilst Ramsey Sinclair, Irene Mangan and Alex Morrice picked up a 3 and then 6 to stay ahead for the whole of the game. Joy Gardiner with Bill and Sue Jordan managed to win with the last wood of the game. 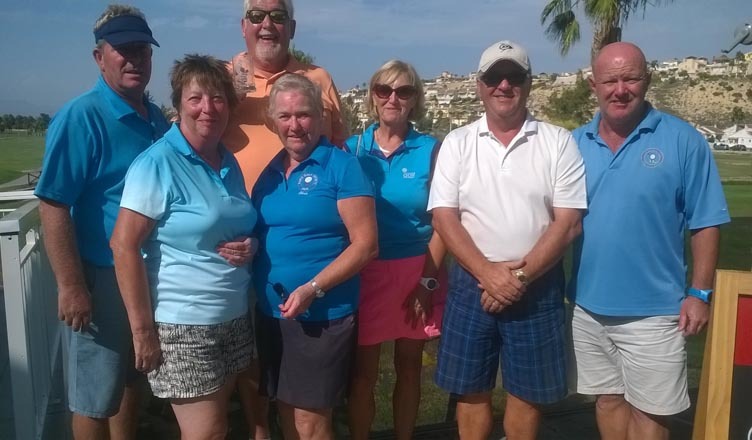 Sheila Chorley, Brian Gardiner & Jean Cooper came back from 7 – 11 down to gain a 17-17 draw. Jo Elkin, George Richardson and John Taylor were behind for most of the game and then came back steadily to be 11 all on the 16th end, only to lose the last 2 ends by 1 shot each. 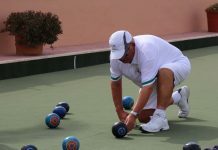 SAN LUIS BOWLS CLUB REPORT 02.06.17. + 09.06.17. I’m catching up after the excitement of the National Championships, and a belated “well done” to all the competitors and the worthy winners. The weather and the summer leagues are heating up well. Wednesday 31st May VCLeague, SL Falcons were away at La Marina; taking some useful points 8-6, shots 106-94. 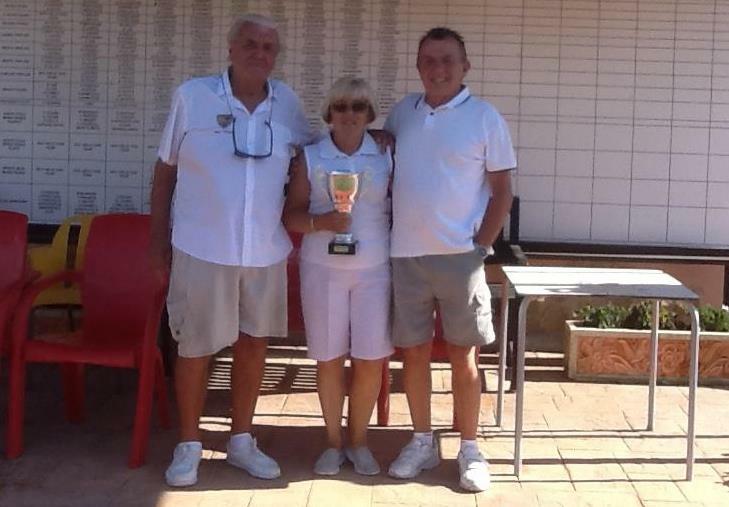 Winners: singles; Russell Marks 21-15, pairs; June & Keith Jones 29-9, triples; Lynne Morris, Sabrina Marks, Tom Hill 18-7. Wednesday 7th June Falcons were away v VB Vikings; a good result, points 10-4, shots 117-78. 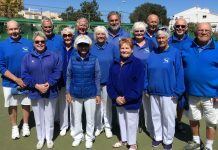 Winners: singles; Pam Lockett 21-15, triples; Lynne Morris, Sabrina Marks, Tom Hill 28-5, rinks; Ann Holland, Neil Morrison, Suzi Cooper, Roy Cordell 19-13, Shirley Verity, Kath Reid, Les Bedford, Jules Pering 24-10. Spitfire Division: SL Wellingtons Friday 2nd June, were away v VB Fairways, shots 81-114, points 5-10. Winners: Allen Bowen, June & Keith Jones 15-13, Carol Lowry, Les Bedford, Keith Lowry 21-16, Mags Haines, Ray Pollock, Phil Morrachan 14-14. Friday 9th Wellingtons at home v LS Wasps, had a bad day at the office 3points-11, shots 87-107. Winners: Allen Bowen, June & Keith Jones 13-11, Bob White, Giuseppe Galelli, Charlie Marigold 17-17. 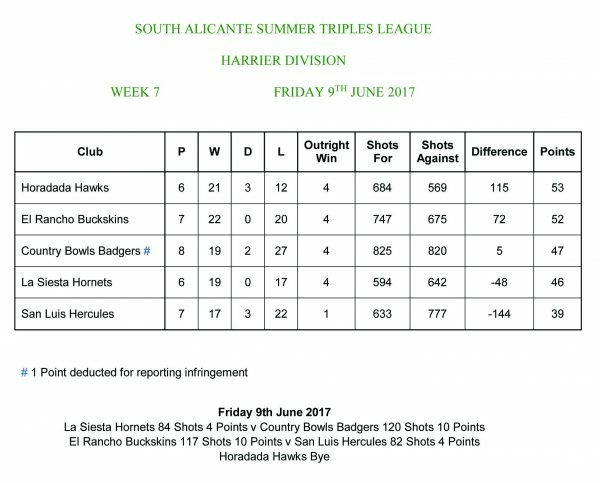 Harrier Division: SL Hercules Friday 2nd away v Horadada Hawks, had a hard fought match for 4 points -10, shots 74-130. Winners: Jim Wright, Chris Brooks, Dave Steadman 17-9, Helen Hammond, Dave Tilley, Scott Malden 18-17. Friday 9th Hercules were away v El Rancho, always a tough venue, points 4-10, shots 82-117. Winners: Tom Fromson, Ian Ross, Robin Harker 16-10, Mary Fromson, Harry Epsom, Sue Ross 16-11. We are still looking for new members to join us for the 2017/18 winter season. We are aiming to enter an extra team in the leagues this year. With 4 teams there should be plenty of games for everyone. We welcome all bowlers, from the most experienced to those who want to step up from purely “social” bowling to the league challenge. 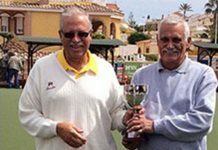 We are a competitive but friendly club and Casa Ventura itself is a hub for the local area, offering a wide range of non-bowling activities. LA SIESTA OPEN BOWLS COMPETITION. 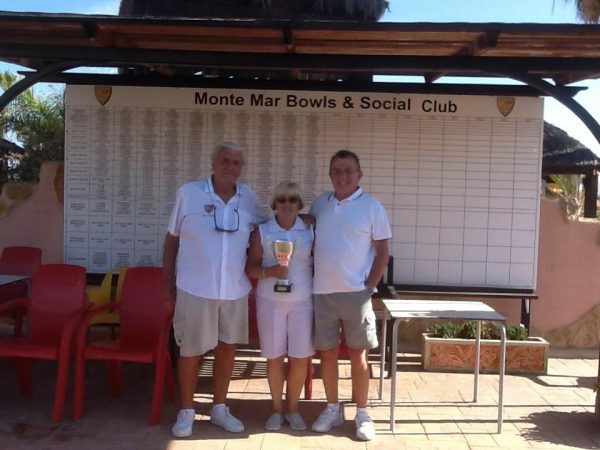 For the second year running Monte Mar Bowls Club were successful in winning the three day La Siesta mixed trip competition. The team consisted of Jean and Rod Chamberlain and skip Bill Young. After winning all their group games they came up against another Monte Mar team in the semi-finals, Ronnie Cairns, June Young and skip Dave Melville. It was a close fought game but Jean, Rod and Bill were the winners they then had to play one of La Siesta’s strongest teams in the final. La Siesta needed two to draw on the last end, thy were holding two but Bill Young with his last wood drew the shot to win the competition. Well done to Monte Mar. MONTE MAR TORROS v EMERALD ISLE VULCANS. match. The Torros won on three rinks and the Vulcans won on two rinks. The sixth rink was a draw. It was disappointing for the Torros to lose the shots by 102 to 101, so it was honours even with 7 points a piece. Congratulations to our winning and drawing rinks. San Miguel Deputies played Greenlands Jasmine away in the VCL winning 10 points to 4. Shots were close, 106 to San Miguel and 102 to Greenlands. Well played everyone!! 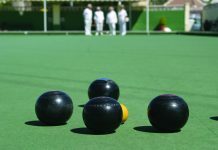 Results were: Ladies Singles, Anita Brown 21-4: Mens Singles, Carl Eagle 21-15: Pairs, Pat McEwan, Gary Raby drew 19 across; Triples, Bob Nesbitt, Dave Champion, Dave McEwan lost 19-20; Rinks, Paul Hayward, Sue Milner, Ann Eagle, John Raby drew 14 across; Rinks, Ken Hope, Stan North, John Marshall, Alan Campbell 38-4. In the Southern League, San Miguel Christians had a good result at home against Emerald Isle Victors winning 9 points to 5. Shots were again close with 106 to San Miguel and 100 to Emerald Isle. Jan Allen, Lee Sinclair, Steve Cantley 19-17; Paul Hayward, Tom Dalgleish, John Raby 20-10; Pat McEwan, Dave McEwan, Gary Raby 26-13; Ken Hope, Brian Allen, Reg Cooper drew 18 across. VCL. The Vikings suffered in the talons of the San Luis Falcons this week, playing at home they just scraped four points which was disappointing. 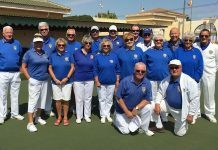 Martin Foulcer, men’s singles won 21-12 against one of San Luis’s star players as did the Pairs duo of Lynne Bishop & Bill Pain winning 14-11. Shots, VB 86 (4) – 117(10) San Luis. The Saxons played San Miguel Sheriffs and did brilliantly to win this away game. Men’s singles, Ian Kenyon won 21-10. 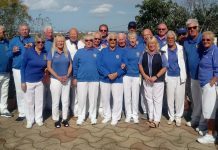 Pairs, Del Gunning & Peter Whitehall won 19-12 and Rinks, Mike Irwin, Sheila Cox, StJohn Broadhurst & Les Barber won 19-11. Shots, VB 78(8) -91(6) SM. 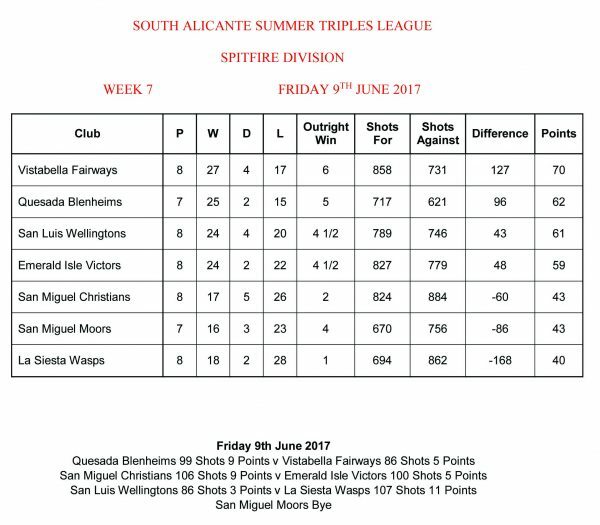 S.A. Spitfire League Fairways travelled to Quesada on Friday, wins on two rinks and a drawn game. Lynne Bishop, Jenny Bowman & Ian Kenyon won 19-15. Eve Blythe, Charlie Watkins & Bill Pain won 16-15. Geoff Paylor, Arthur Brown & Ken Cuthbert drew 17-17. 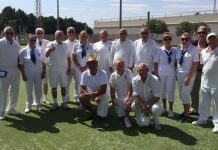 Shots, VB 86(5) – 99(9) Q, Hurricane League Greeners welcomed the La Marina Pilots to Vistabella and enjoyed a great result. Mike Irwin, Sue Norris & Pat Rafferty won 22-13. Del Gunning, Dave Chaplin & Dave Jenkins won 20-11. Frank Barclay, Peter Cadwell & Barry Norris 19-12 and Ron smith, Brian Pointon & Bill Corbishly 22-16. Shots, VB 106(10) -89(4) L M.
The league tables make interesting reading, keep up the good work everyone. Next articleOVER & OUT FOR ELCHE, BUT WHAT NEXT ?